BIKINI BODY MOMMY™ — DIASTASIS RECTI 101: Why some moms shouldn't do crunches! 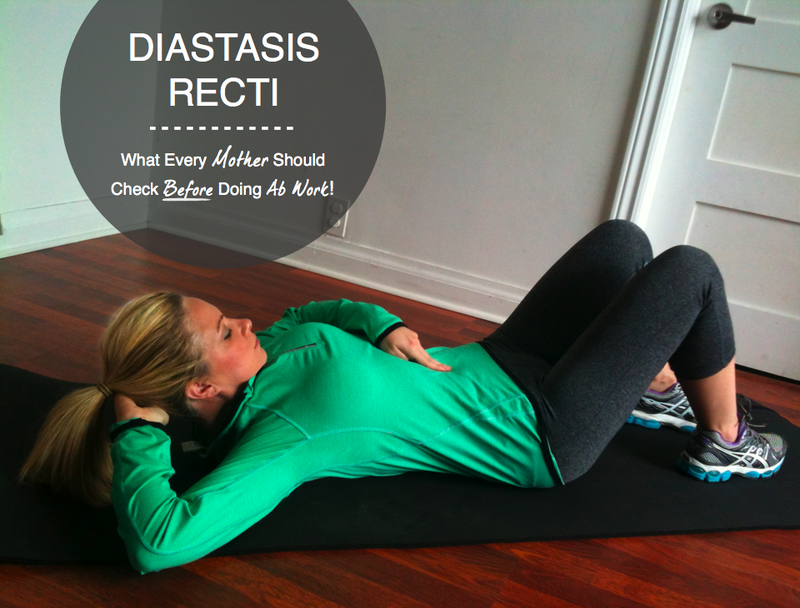 DIASTASIS RECTI 101: Why some moms shouldn't do crunches! If you've never heard of Diastasis Recti, you're not alone. Diastasis Recti (no, I'm not speaking french... Pronunciation: dye-uh-STAY-siss REK-tye) is a serious condition that effects 1 in 3 mothers to some degree. That's a pretty staggering number of mommies -- and sadly, very few of us even know what it is, and MOST IMPORTANTLY -- How to FIX IT! Diastasis recti also known as ("abdominal separation"), is a condition where the right and left sides of the rectus abdominus (the muscle that makes up the front wall of the abdominals, also known as the “six-pack”) spreads apart at the body’s midline. Welll .... when the abdominal muscles separate, it weakens your entire core's support system -- resulting in a severe pelvic tilt, lower back pain and that dreaded "mommy tummy " or “pooch.” If you have diastasis, the mommy tummy or pooch that you are so unhappy with, could actually be your protruding organs! They protrude because instead of being supported and pulled in by your muscles (if they were together), they are now only being supported by a thin (saran wrap-like) piece of connective tissue. SCARY, because if there is trauma to the abdominal area and the connective tissue is torn away from the muscle, your organs will come through and a ventral hernia can develop. In which case, surgery would be required to repair it. The object is to determine how many fingers will fit in the space between the two recti muscles. You also want to determine the condition of the connective tissue. The deeper your fingers will go towards your spine, the weaker the connective tissue. Start with your index and middle fingers. STEP #1 Lie on your back with your knees bent. Place TWO fingers just above your belly button, pointing down in the direction of your toes. STEP #2 Relax your abdominal muscles and lift your head. You might have to come up and down a few times so you can feel how the muscles work. You are trying to feel the two ridges of the muscles strait down your midline and feeling for a gap. If you don't feel a gap (separation) with 2 fingers, you may have to put more fingers in. If you see the football- like ridge you should start by using 4 to 5 fingers. Do YOU feel a gap GREATER THAN 3 FINGERS wide? DON'T FREAK OUT. It is NEVER too late to close a diastasis! Closing a diastasis is all about healing the connective tissue. How long it takes depends on the severity of your diastasis and your commitment to the program. If you have a moderate (2-3 finger gap) to severe (5 finger gap or MORE) case of diastasis, the absolute WORST THING that you can do is "traditional ab work" like crunches and planks. Those types of movements actually pull the muscles apart and only make your condition WORSE. A lot has been written about how to successfully rehab diastasis, but at the forefront of the applied research stands a woman by the name of Julie Tupler. Julie is an RN, who wrote a book called "Lose Your Mummy Tummy," which has quickly became the "Diastasis Bible" of sorts for both medical and fitness professionals around the world. Tupler Technique Exercises. Here is a brief excerpt, from Julies Book. Don't be fooled, you might look at this workout and think it’s way too easy. But if you have a diastasis, it’s actually very challenging! If this condition effects you, I would recommend halting all traditional "abdominal exercises" (you can still do MY WORKOUTS, minus the ab work!) and start doing the workouts provided above on this page until your separation heals. Depending on the severity, Julie states that through her Tupler Technique® it could take you anywhere from six weeks to a year to close your diastasis. Obviously if you choose to implement all of the rehab steps in her program -- odds are your diastasis will only heal that much faster! Older PostWhere the Heck Have I Been? !